Communication gaps in the workplace can lead to unclear motives, indecisiveness, and even misaligned priorities. Whether caused by technical issues or personality differences due to generational gaps, it is essential to find – and correct – any communication flaws you find as soon as possible in order to ensure your business is operating effectively. Before you can begin to correct communications problems, you will need to pinpoint exactly where the problem or problems are occurring. Track your communications in order to find out where the message is being lost: Is it a specific department or employee who frequently drops the ball? Is there a technological problem at fault? Make note of each and every issue you encounter so that you can correct the problems all at once. In many cases communication breakdowns occur due to issues with interpersonal relationships in the office. Evaluate how all your departments and team members work with each other and make note of any acrimony in the office. Teambuilding programs or staff-wide meetings may be necessary in order to ease the tension and improve communication between quarreling departments or employees. Many companies have found that the best way to ensure that everybody communicates effectively is to enforce the usage of a specific method of communication. Whether you choose Skype, Google Hangouts, or a proprietary program designed for your company if ultimately up to you but having a direct, instant line of communication between each and every employee is often the best solution to communication breakdowns. When enforcing a new method of communication it is essential to its success that you ensure each member of your staff knows how to correctly use it as well as understanding the expectations that go along with it. Provide complete, in-depth training on all new communication methods and designate one or two in-office “experts” that confused staff members can go to with their questions. After tracking down the communications issues and implementing the appropriate solution, it’s important not to simply forget about the whole thing and assume that your solutions are working. Set a date to re-examine your communication structure and ensure that all issues have been resolved, and ask for feedback from employees in order to identify future improvements to workplace communication. 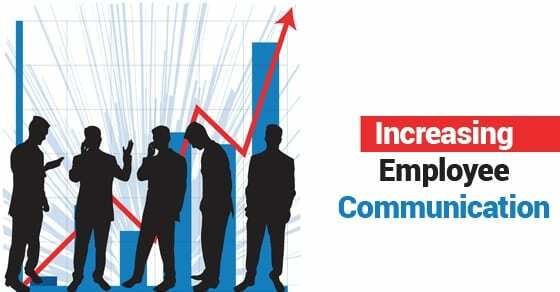 Without effective communication between staff, you’re likely to experience an uncomfortable working environment, less productive throughout the day, and ultimately a lot of time lost trying to fix mistakes made because of miscommunication. Follow these tips to keep the professional conversation flowing and you’ll be sure to have your organization running in the best order possible.